Use SouthAfrica.TO flight discount vouchers to reduce airfares. If you have no vouchers then start earning them with your East London to Johannesburg flight - just email us a review of your flight, and we'll send you a discount voucher. 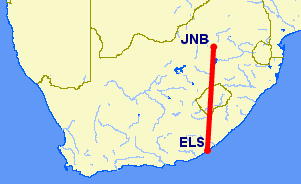 Kulula does not operate flights from East London to Lanseria International Airport.